Arabian marriage process has lots of common specialties with Anatolian region traditions. First, mother or aunt of the groom sees the bride to be. Afterwards, they investigate girl’s character and talents from surroundings. It is the eldest person of the family’s duty to ask for the girl’s family for permission to give their daughter as a bride. After few visits, if girl’s family also accepts, engagement will be held. After this, two families go to bazaar to buy gold. According to the families’ economical conditions, they buy gold for the bride. Engagement party is sometimes with food and drinks and sometimes just be held between families. Engagement period is determined in advance and mostly do not pass 6 months. In some regions, it can last 2-3 years. There are some traditions are applied during the engagement period. For example, the family of the groom visits bride’s family and give money to bride on those visits. In this period, both families and bride and groom try to know each other. It will be determined if bride and groom can get along well or not. If something happens in this period and if there is a disagreement, the couple breaks up. In this case, it is traditional that bride gives the gold and presents which are bought for her by groom’s family. If engagement process goes well, then it is time for wedding. Wedding ceremony differs from region to region. Besides, the economical conditions of the families determine the wedding ceremonies. Traditionally wedding ceremonies lead 3 days. First day all neighborhood meets, foods are prepared and entertainment begins. The very next day is henna day. Henna ceremony is held in bride’s house. On 3rd day, bride is brought to groom’s house with a car. India has a very mixed culture. This is the reason why the wedding traditions in India are different and richer than other countries. Everything you see can be exotic for you. In India, there are lots of different types of traditions for weddings. One of these traditions is the families’ weddings whose economical condition is well. Wealthy families’ weddings are very luxury weddings. Moreover, weddings in India usually determined by religion and astrology. Some families goes to an astrologist to look at the couple’s horoscope map before wedding. This wedding horoscope map called ‘’Navamsa’’. This map is important to understand planets’ powers and it is considered as a guide. The problems which may occur in the future in a marriage can be seen before with this map and it will be decided that if the couple can get married or not. In India, this map commonly is used before marriage. In India, Groom is responsible for the dress which Bride will wear on wedding. Bride wears a dress called ‘’sari’’ in the wedding instead of a white bridal dress. Bride wears daily clothes on wedding and change her clothes after groom gives her the dress which he bought for her. One of the most mixed cultural countries is Pakistan. The wedding traditions in Pakistan mostly depend on region and religion. In Pakistan, there is a huge difference between city traditions and village traditions. This is the reason why there is a huge difference between traditions. The most common tradition in mystical Pakistan is to try the groom’s patience. In some regions in Pakistan, groom candidate is tested by the bride’s family’s elder ones. This test includes all the curses and acts and groom candidate should stand calm while all these things are happening. If the groom candidate passes the test, it means he got the permission for wedding. Wedding is based on astrology in the most crowded and cultural far east country China. Groom’s family goes to an astrology expert to ask for an opinion for the couple who will get married. If the horoscope which is prepared by the astrologist is found proper by the groom’s family, they tell the bride’s family to do the same process. In China, tea is an important aspect between the wedding gifts which will be given to bride’s family. Before the wedding, groom prepares the marriage bed and put some oranges, nuts and different kinds of fruits on the bed. The children in the family sit on the bed and play with these fruits. The more children on the bed mean the more fertility. Bride wears red shoes and red veil on wedding day. In Bulgaria, groom goes bride’s family’s house to ask for a permission to get married with their daughter and bring his best friend with him. They take a special whisky called ‘’rakia’’ which symbolizes happiness, health and wealth and a green flower bouquet called ‘’zdravet’’ with them as gifts. Father of the bride serves drinks to guests as he is the chief of the family. If he likes the groom candidate he turns and asks her daughter if she is ready for a marriage or not for 3 times. If the daughter says yes , wedding process starts. One day before the wedding ceremony, usually on a Thursday, special bread is made and this bread symbolizes a new beginning of a new family. In Bosnia Herzegovina, groom candidate is invited to bride candidate’s house for a dinner. Elder ones of the families discuss about wedding. After the bride’s family made their decision on groom candidate, coffee service starts. Coffee with sugar means the groom candidate is found proper for a marriage and if the coffee is plain it means he is rejected. In Korean wedding traditions, ducks and gooses takes an important place. According to old traditions, grooms come to take brides from their houses with a white horse and a goose between them. Nowadays they are using a wooden goose instead. Another tradition is to put 2 wooden ducks in couple’s house. If ducks faces are face to face, it is believed that the couple will get along well. In some regions in Africa groom candidate asks the girl’s parents for permission to get married with her. If the family accepts the proposal, they give their daughter some money and peanuts. Bride candidate shares peanuts with groom to be. This means a wedding invitation. 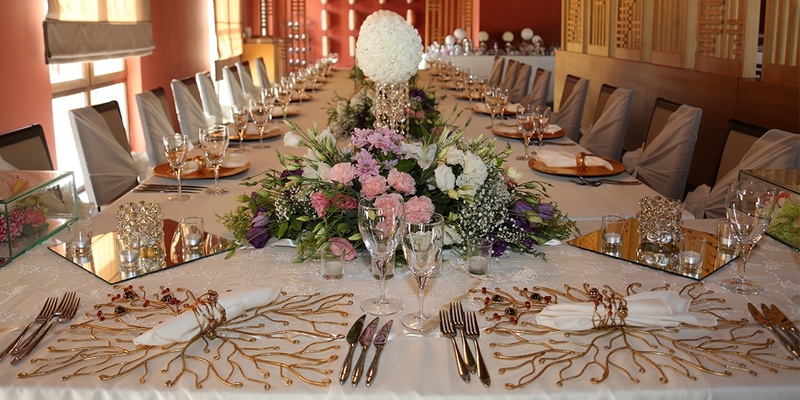 Wedding city Antalya is a multinational and international wedding operator which based in Antalya, Turkey. We can organize your traditional wedding ceremonies in Antalya. If you want to have your dream wedding with all your traditions, please call us.